Las Vegas — On Friday, March 11, Invicta Fighting Championships visited the Trinidad Pavilion at Tropicana Las Vegas for its 16th event. The event streamed live and exclusively on UFC Fight Pass at 8:30 p.m. ET. Invicta atomweight champion Ayaka Hamasaki faced adversity in her first title defense against challenger Amber Brown, but the Japanese fighter retained her belt with a third-round armbar finish. Hamasaki landed a takedown in round one and landed punches from the top position, but Brown threw up a triangle choke and Hamasaki was forced to defend. Round two was nearly a carbon-copy of the first, but Hamasaki attacked the right arm of Brown with a keylock and a straight armbar attempt. In round three, Hamasaki’s repeated attacks on Brown’s arm paid off as she was able to extend the arm and coerce a tap. Brazilians Jennifer Maia and Vanessa Porto put on a show in the night’s co-main event, with Maia leaving the cage with the interim flyweight title. Porto came out aggressive, dropping Maia with a right hand in the opening stanza. Maia recovered, but Porto continued to come forward with kicks. Porto scored with a big slam in round two and nearly locked in an armbar. Maia survived the early action and established her range on the feet. Porto’s nose bled badly as the fight wore on, as Maia’s combinations found a home. Maia surprisingly locked up an armbar of her own in round four, but Porto was able to defend. The fifth round decided the title affair, with Maia proving to be the fresher fighter. 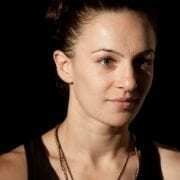 Maia sought a late guillotine that Porto escaped, but the judges handed Maia Invicta FC gold. 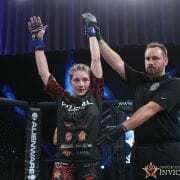 Strawweight Angela Hill proved that stepping up on short notice was no big deal, as she stopped former title fighter Stephanie Eggink by second-round TKO. Hill was in Eggink’s face early, but Eggink found openings for body kicks. As Eggink continued to kick, Hill found her timing and began to counter. Multiple overhand rights found the jaw of Eggink and in round two, a heavy shot sent her crashing to the ground. Hill followed with more punches and the referee waved off the bout. Mexico’s Irene Aldana needed just three minutes to give UFC veteran Jessamyn Duke a rude welcome back to the Invicta cage. The bantamweights exchanged punches from the opening bell, with Aldana repeatedly finding Duke’s jaw with her right hand. A heavy shot wobbled Duke along the cage and Aldana smelled blood. She unleashed a flurry of body shots that saw Duke crumble to the canvas for the TKO. Veteran Roxanne Modafferi and former title challenger DeAnna Bennett battled hard for three rounds. Modafferi’s forward pressure was the story of the fight, as she frequently backed Bennett against the cage. Bennett earned a big slam in the first round, but the action largely played out on the feet. Modafferi’s volume punching forced Bennett to counter with body kicks, but she could not match the output. When it was all said and done, the judges were split; leaving Modafferi victorious. Atomweight Jinh Yu Frey made her case for a title shot, outworking former titleholder Herica Tiburcio en route to a unanimous decision win. The pair spent the majority of the fight on the feet, trading combinations. Tiburcio chewed up the lead leg of Frey with kicks, but Frey’s ability to counter with punches were the difference. Frey dropped Tiburcio with a left hand late in round two, but ultimately the fight went the distance. Making her flyweight debut, veteran Sarah D’Alelio outlasted a very game Andrea Lee, scoring a late, third-round submission victory. Lee’s striking arsenal was on display in the first frame, as she battered the lead leg of D’Alelio. D’Alelio answered with wrestling in the middle round, leading to a do-or-die final five minutes. Lee scored with a gorgeous hip toss along the cage, but D’Alelio scrambled to top position and then transitioned to Lee’s back. Once there, she slapped on the fight-finishing rear-naked choke and Lee was forced to tap. Stepping in on short notice, unbeaten Aspen Ladd put on a clinic in her bantamweight debut. Ladd immediately took opponent Kelly McGill to the ground and showcased her strong grappling game. Ladd threatened with choke attempts, but it was her steady stream of punches and elbows that took its toll on McGill. In the third stanza, Ladd poured it on and forced the referee to halt the contest. In the night’s opening bout, debuting strawweights Ashley Greenway and Sarah Click fought hard for three rounds. Click scored with kicks early, but Greenway found her range midway through the fight. The final frame was all Greenway as she scored a takedown and tied Click into knots with multiple submission attempts. The judges rewarded Greenway for her efforts with a unanimous decision nod. Enjoyed all the fights. Technical excellent and exciting main event. Thought the co event was going to be over in the first, well done Maia. Hill seems to be getting better every fight. Modeferi seems too nice to be doing this? 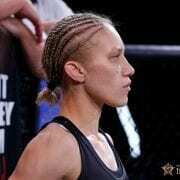 Look forward to Invicta 17.